Communism is not usually regarded as a green political system.The lack of attention to negative environmental externalities on the part of central planners bequeathed the areas under their control a legacy of wilted forests, poisoned waters and darkened skies. The dissolution of the Soviet empire revealed these failures to the world – the overflowing chemical sink of Dzerzhinsk, the black sulfurous snows of Norilsk and, most iconically, the radioactive zone of Chernobyl. The post-Soviet economic collapse idled the smokestacks and destroyed many of the most egregiously polluting enterprises; yet the hellish mills grind on in China, home of 16 of the world’s 20 most polluted cities. So the claim that Communism could have saved the planet from ecological oblivion will no doubt be met with a fair amount of skepticism. However, we must first define what kind of pollution we’re talking about. For instance, European medieval cities lacked the most basic sanitation and epicenters of pestilence. Until the nineteenth century, their death rates were permanently higher than their death rates, and needed a constant influx of people from the countryside to sustain themselves. 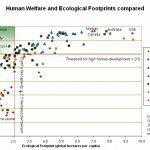 However, in that period humanity’s ecological footprint, even measured per capita, was very small and sustainable. This is because that kind of pollution was extremely localized. Modern man would no doubt find life in the medieval city unbearable, at least initially. However, if you venture outside its (typically small) perimeter, a lost world of bucolic idyll would open up before you. (Then you’d get hanged for vagrancy or killed by bandits or starve to death, but that’s beside the point). In pre-industrial and early industrial civilizations, although localized pollution may be extreme, global pollution is minimal. As is well-known, CO2 is the major greenhouse gas that contributes to anthropogenic global warming. Between 1000 and 1840, the global CO2 concentration fluctuated between 275-285ppm. It only began rising appreciably when the world entered the age of iron and steel around 1850, still very slowly albeit extremely fast by geological standards. Although disrupted by the discontinuities of the Great Depression and the Second World War, the post-1950 age of cheap oil that fueled the American economic miracle, European recovery and the large-scale industrialization of the Soviet bloc and Japan turbocharged CO2 emissions. The 1970’s oil shocks moderated but did not check this secular trend. High oil prices spurred investment into oil operations in remoter regions free of OPEC’s price-setting and eventually brought prices down. The opening of China from the late 1970’s resulted in its becoming the coal-powered workshop of the world by the new millennium. 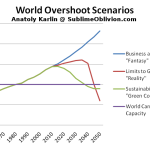 This was part of a general global trend in which the developing world ditched Marxist-inspired theories of economic development in favor of freer markets, albeit outside Asia the economic results were usually mixed. Meanwhile, CO2 emissions again spike on up, while its atmospheric concentration kinks ever more upwards – a dark singularity that may potentially doom human civilization. Viewed from a long timescale, the past century of environmental vandalism looks like a singularity. Unlike the human lifespan, which is measured in decades, the biosphere is measured in hundreds of millions of years. As such, to Gaia humanity already appears as a disruptive and alien technological Singularity. From the dialectical materialist perspective, this is the Law of Negation at work – just as each class begets its own gravedigger, so homo sapiens builds its civilization upon the bones of the biosphere that gave it birth, leaving behind only desert. One of the effects of Communism in the twentieth century was that it stifled the growth rates of the countries it infected. In 1950, China and Taiwan had similar levels of economic development. However, there was a generational difference between when these two countries opened themselves up to globalization. Taiwan began developing as a market-driven export hub from the 1950’s; China joined the Asian tigers only in the 1980’s. Today Taiwan belongs to the rich club of nations, while China is still in the throes of development and only recently moved into the ‘lower middle-income’ rank. Since these countries are culturally similar (most of the world recognizes them de jure as ‘one China’) and were at roughly the same level of development prior to the Chinese Revolution, the difference between them can be safely attributed to Maoist inefficiency and chaos. Energy, or more precisely exergy that is used for useful work, is a key factor of growth – a neglected topic in classical economic growth theory that has only relatively recently been addressed by the work of Robert Ayres and others. Since up till now the most intense and effective energy sources have been hydrocarbon based, they make up the lifeblood of our industrial civilization. Burning fossil fuels releases CO2. First, heavy industrialization boosts CO2 emissions per capita to around 5-10 tons; afterward, automobiles and other consumption push them up by another 5-10 tons. From 1990 to 2003, Taiwanese CO2 emissions doubled to 12.4 tons as its citizens became rich and bought up vehicles and household appliances. South Korea went up from 5.6 tons in 1990 to 9.8 tons in 2004. Massive industrial expansion in China raised their emissions from a meager 2.1 tons in 1990, to 3.8 tons in 2004 and more than 5 tons by 2007 – the consequence of becoming the world’s largest producer of steel, cement, aluminium and a whole host of other heavy industrial products. The difference, however, is that the combined population of South Korea and Taiwan are less than 10% that of China, so increasing per capita emissions in the latter are having a vastly greater global impact. In absolute terms the increase in world CO2 emissions since the millennium has been the greatest in human history. Although China’s economic potential was the most suppressed of any country under Communism in absolute size, Russia’s has been held down for the longest period. At the dawn of World War One, the Russian Empire enjoyed the fastest rate of industrial growth of any European country. Without the ‘lost decades’ of the Civil War (1916-28) and the Great Patriotic War (1941-50), it is entirely feasible that it could have become a fully industrialized country by the 1950’s, instead of the 1970’s. Furthermore, like Japan it would have developed a mature consumer economy by the 1970’s, instead of the 2010’s or 2020’s as seems likely today. The demographic dividend from cutting out the Civil War, Stalinism, World War Two (it is unlikely that Hitler could have come to power in Germany were it not for the Communist specter) and falling post-1965 life expectancy would have meant that Russia’s population today, assuming similar fertility trends, would be around 200mn rather than 141mn. This demographic dividend would also be reflected in Eurasia and east-central Europe in general. What all this implies is that per capita CO2 emissions would have reached around 20 tons per capita by the 1970’s (similar to Canada or the US – remember that Russia is a cold, resource-rich country). In conclusion, Eurasia’s and east-central Europe’s potential contributions to CO2 emissions could have been as as great or even greater than China’s during the course of a non-Communist twentieth century, due to the fact that their development (and pollution) was suppressed for a longer period of time. Finally, without a respected and powerful bastion of Communism in the world in the form of the Soviet superpower, Marxist economic ideas would not have enjoyed such wide traction in the post-colonial developing world. The ‘License Raj’ might not have been a feature of Indian life, thus possibly accelerating its development by one or two decades such that today it would be an industrialized if not yet consumer-orientated country. Without its legacy of import substitution and bureaucratic overload, Latin America would probably be both richer and a bigger global pollutant. (This is not to say, however, that the region will have converged to advanced country living standards. Like the Arabs and Africans, and unlike east Europeans or the Chinese, the low emphasis these cultures place on education means their basic economic problem, low human capital, would have put a plateau on their potential GDP well below developed standards, as I argued extensively here). Taking historical CO2 emissions since 1950 as my base, I constructed two scenarios – Capitalist China, in which the Chinese Revolution of 1949 was averted; and No Communism, in which the 1917 Russian Revolution was thwarted and no other severely anti-capitalist ideology took over a large share of the world’s economic capacity in the twentieth century. To construct Capitalist China, I assumed historical CO2 emissions up to 1975, a rise to 5 tons per capita (versus historical 2.1 tons) by 1990, and a further rise to 10 tons per capita (versus 3.8 tons) by 2004. This assumes that like South Korea or Taiwan, the latter stages of heavy industrialization occur in 1975-1990 (in reality: 1990-2008) and that 1990-2004 sees the development of a prosperous consumer economy. 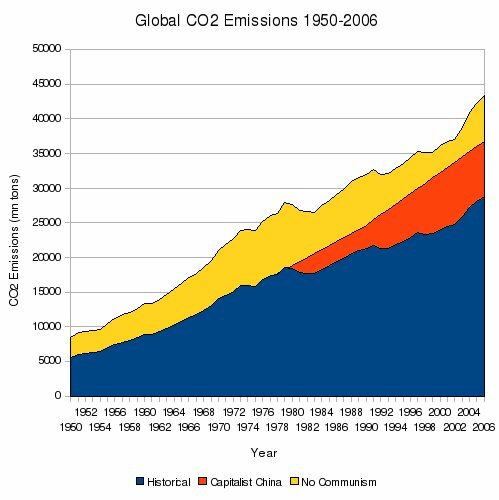 In No Communism, I just crudely assumed a flat 50% increase in CO2 emissions for 1950-2006. The Capitalist China scenario is, I believe, robust albeit crude. I worked out a new value for 1990 and for 2004 global CO2 emissions, assuming the above increases in Chinese pollution, and linearly connected them with straight lines. It suffocates the details out of the picture, e.g. the oil shocks and their effect on CO2 emissions. Nonetheless, this is permissible since we’re talking about an alternate history decades down from its branching point, so assuming a simple repetition of the Arab oil embargoes is pointless. It does however show the huge impacts on cumulative CO2 pollution caused by delayed Chinese industrialization. Since there is no ordered data for national CO2 emissions prior to 1990 (and in any case aggregating and manipulating them all would require far more work than I’m willing to do – we’re talking generalities here), I basically assume a 50% increase of CO2 every year over historical levels. Although towards the high end, I do believe it’s justified. If Russia and its peripheries had become industrialized by the 1950’s, rather than the 1970’s, that would have added around 250mn more people into the industrialized world, at a time when it consisted of perhaps 350mn Europeans whose economies were devastated by war and 150mn Americans. The Third World would have started developing a great deal quicker without the influence of Marxist thought on economics, which is pernicious to traditional growth. 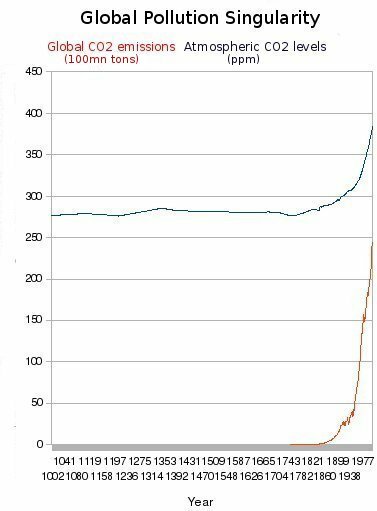 The oil shocks of the 1970’s would instead have correlated to the oil shock of 2008, the harbinger of peak oil. After that, with renewable energies still in their infancy, the late twentieth century would have seen the substitution of oil for much dirtier coal, whose increased pollution would have canceled out the effects of more natural gas and nuclear power, let alone fledgling wind or as yet non-existent solar. Therefore, overall I think the 50% over historical levels CO2 pollution is a reasonable assumption for a non-Communist century. That said, what role would these increased emissions have had on atmospheric CO2 levels, in a world where Eurasia and the Third World declined Marxist economics and China followed Taiwan’s and South Korea’s development path? When looking at the historical data, I found that in any year the gross amount of CO2 emissions and the increase in the level of atmospheric CO2 are very closely correlated (to the extent that there’s no need to even bother with a proper straight line fit). This stands to reason – human emissions of greenhouse gases have long since far surpassed the ability of the world’s sinks to swallow them. After simplifying the relation between emissions and CO2 levels as a basic linear formula, I applied it to the two emissions scenarios detailed above and came up with this graph. Note – to account for Eurasian industrialization and no World War Two between 1917 and 1950, the CO2 level in 1950 is set at 317ppm, corresponding to the real 1960 level, instead of the real 1950 level of 311ppm. As of 2006, the atmospheric CO2 level was at 382ppm and soaring at a blistering rate. However, had just one country, China, embraced globalized markets just a generation before it did, the CO2 level in 2006 would have been a full 10ppm higher, at 392ppm. That it did not, bought the world five additional years in which to curb material throughput or make a technological breakthrough that would avert climate catastrophe. Furthermore, if the globalized idyll of before 1914 were not shattered and if Communism remained confined to the world’s libraries and universities, CO2 levels in 2006 would have been at 421ppm – at today’s rate of CO2 increase, equivalent to fifteen years of breathing space. Peoples suffered under Communist regimes so that humanity could survive. That is a bold statement that might seem rather insane and perhaps callous. Let me explain. The EU defined anything greater than a 2C rise in global temperatures to be a ‘dangerous’ level of warming and set itself targets to avoid it. Although at those temperatures the Great Plains breadbasket, coral reefs and the Arctic icecap are all doomed to desertification and extinction, truly catastrophic warming and widespread human ‘die-off’ are likely to be averted. According to climate modeler Meinshausen, meeting the 2 degrees C climate target means that atmospheric CO2 levels have to be stabilized somewhere around 400ppm – and even then, we’re only giving ourselves a slightly greater than break even chance. 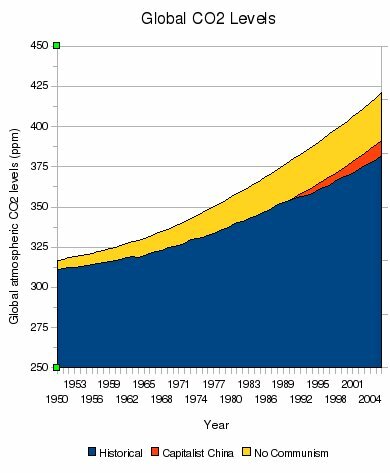 For this to occur, emissions must peak by 2015, halve from 1990 levels by 2050 and peak atmospheric CO2 levels must not exceed about 450ppm. (Consult the linked paper for more details, it has caveats on probabilities, the effects of other ‘CO2 equivalent’ greenhouse gases, etc). Furthermore, the above work neglects recent research into positive feedbacks in the global climate system. Should the global temperature reach a certain ‘tipping point’, it is possible that it will unleash self-reinforcing ‘runaway warming’. The vegetation and forests of the world will switch from being carbon sinks to carbon sources, as decay overtakes growth. Large parts of the Amazon are projected to burn up and become desert, releasing more CO2. In possibly the most under-reported story of 2008, vast tracts of Siberian permafrost and Arctic gas hydrates are already melting rapidly and releasing methane, a gas twenty times as potent as CO2 in its contribution to global warming. The past decade saw the biggest relative growth of global CO2 emissions since the 1960’s (and the biggest in absolute terms), so we are very far from stabilizing them. The current economic crisis is hurting the renewable energy industry and public commitment to green projects, even as the world once again bathes in a cheap noxious brew of hydrocarbons. And all this is quite disturbing. We are already at the edge of the precipice, and this in a world where Communism suppressed the economic and polluting potential of vast swathes of humanity like a compressed spring for most of a century. 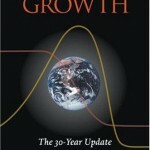 If Eurasia had been allowed to become a normal consumer economy and if China and the rest of the old Third World hadn’t been stalled in their large-scale industrialization by the shackles of socialism, we would already be at an atmospheric CO2 level of 420ppm or so and well on the road to oblivion. Meanwhile, we would still be at around the same technological level as we are today. Thus, Communism played a key role in the last century in the salvation of mankind. However, as discussed above, the survival of advanced civilization is still far from assured. Yes, we might still be rescued by a technological breakthrough. For instance, recursively self-improving machine intelligence could negate humanity and transcend its climatic problems. Unfortunately, the dates postulated for the technological Singularity by most thinkers, around the middle of the century, are just about the time when credible ‘business-as-usual’ models of climate catastrophe and resource depletion foresee the collapse of advanced industrial civilization amid a global die-off. It would do no good if computer scientists finally unlock the inner secrets of the human brain just before their lab is stormed by a starving mob that lynches them and destroys the machine that just minutes before had passed the Turing test with flying colors… The twenty-first century will be a make or break century – Olduvai Gorge or technological Singularity. Of course, it’s possible that just before falling over the cliff, humanity does manage to incubate machine intelligence, which will precede to take over the world on the bones of their biological parents, just as we in our time took over the biosphere and left behind deserts. That would make for a most sublime demonstration of the Laws of Negation and of Transformation in dialectical materialism. It should be transparently clear that Green Communism is the wave of the future. The capitalists are morally, and now financially, bankrupt, with the Ponzi scheme that is global finance unraveling before our eyes. We can live without the Madoffs and made-offs of this world; we cannot live in a world of metastasizing deserts and encroaching oceans. The zombie masses of the consumerist have blindly worshipped the false Gods of material growth, directed in their idolatry by cultural hegemony of the capitalist elites. 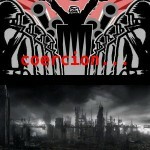 The masses must be woken from their gasoline-fume induced stupor, before stern Mother Nature does it for us. Green Communism is the road to redemption for consumerist sins of greed and gluttony. The Europeans are too soft and effete to give up on their luxuries, the Americans too enamored of their bankrupt and soulless capitalist system. Russias are already infected with the poisoned chalice of mass consumerism, and never made good Communists anyway. Ironically, the best hopes of foisting a true values shift upon the world may lie in China. They have finished building up their heavy industrial base, but have not yet developed to the stage of mindless consumerism. Now they stand at a crossroads. Their Communist party can either opt for the patently bankrupt philosophy and way of life that is neoliberalism, or they could ignore the temptations of listening to shallow popular sentiment and start focusing on material and spiritual transformation. The world must arise as one in revolt against the neoliberal System, overthrow the warmongers and capitalists and institute a global network that will focus its energies on technological innovation and spiritual advancement – surely worthier goals than today’s prevailing commodity fetishism. China may be the locus, but whichever nation or region first takes upon itself the holy burden should not be left alone – otherwise, surrounded by predatory and cynical capitalist Powers, it will fall into the same militarism and parochialism that destroyed the Soviet soul and ultimately its material foundations. Society should be fundamentally restructured. The productive capacities already exist to provide everyone with food, shelter and a reasonable standard of living. Economic activity should be geared almost exclusively to technological research, as well as maintaining existing productive capacities and social obligations. Material throughput must be drastically reduced and all major economic activities subject to stringent sustainability criteria. Patents and elite universities should be replaced by and the collaborative spirit that is aspired to in academia and free, quality education over the Internet (on the model of MIT’s courses). The workers must be guided out of their false consciences, which the elites hoisted so long upon them to imprison them, and new, smaller generations should be reared in factory incubators. The development of bottom-up nano-manufacturing and deep machine intelligence will bridge the Olduvai Gorge and transform human civilization into the post-scarcity paradise that is Green Communism. Notes: My main sources were the Earth Policy Institute for global CO2 emissions and atmospheric levels, and Wikipedia for national CO2 data. You can also look over the data file (.opd) used.